When you’re renovating your kitchen, you might have your countertops all picked out and ready to go but haven’t thought much about the backsplash that will go with it. We want to help you make the right choice when it comes to picking out what will look best with your new kitchen countertops. Grout Restoration Works knows all things tile and grout and specializes in the aftermarket care. We want to help make the right choice by giving you a few pointers. There are a lot of different options and much is dependent on your budget. There is always option to take the granite all the way up to meet the cabinets. Or you can do your standard 4 inches of granite on the wall. However, you want to consider what and how things are going to splash on the walls with them not being covered well. If you’re wanting something to cover a bit more but don’t have the budget to get more slabs of granite to cover your walls, then here are the best options for you and your family. Tile is another option that you’re able to use as a backsplash and it is generally easier on the pocket. There are a lot of different tiles and styles. Therefore, we need to look at the pros and cons of to all. Give careful thought to your what your family is like and the ages of your kids. Is there going to be a lot batter flying around when the kids use the blender? Or is there going to be oiling flying everywhere when you make bacon? 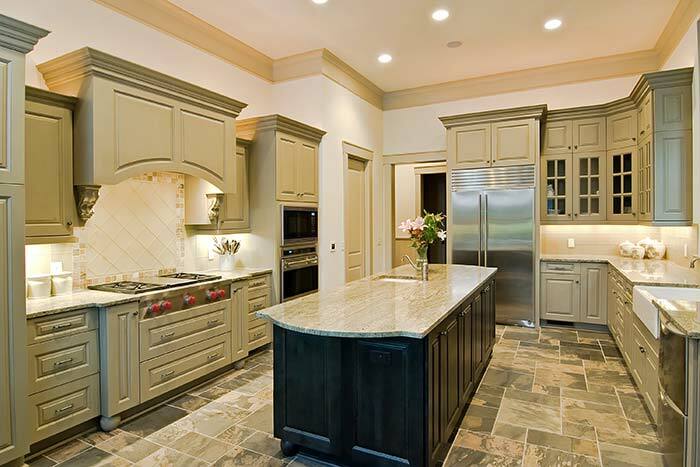 Depending on what is going on in your kitchen will help you to decide what type of tile is going to be best for you. When you think about what your family makes and uses a lot in the kitchen you’ll narrow down a lot of your options. For example, if you like to fry things a lot then you’ll want to consider how that is going to affect your tile and grout backsplash as the years go by. Often, you’re left with a film of grease that is hard to remove from the grout. Therefore, you’ll want to go with the least amount of grout as you can. That then take out of the picture mosaics because they use small tiles and a lot of grout lines. You’ll want to go with big tiles because that will give the least amount of grout lines to deal with and clean. However, if you’re not the type of family to make big messes then a mosaic is in your list of options. No matter what you choose don’t get too carried away in the options for colors. Pick one color out of your granite that you like and go with it! Picking a backsplash can be difficult because there is a lot involved. However, there is no need to stress out. Pick the perfect color by finding a color speckle that you love best out of your granite. Then carefully consider how messy your family is in the kitchen to determine the type of tile backsplash you should get. No matter what happens Grout Restoration Works can fix almost anything that might or could go wrong with your tile and grout. Call us today for a free home estimate!